Embodying memory in a way that draws the viewer into an emotional exchange with a distant other, Doris Salcedo’s work exemplifies the theme of this chapter. The work is open to quite personal readings and in a very important way the subject is the experience of embodied memory rather than any specific story that might lie behind it. There is however an unavoidable and pervading sense of loss and mortality about most of her art that is informed by her personal history: in Colombia people sometimes just disappear. They may be held hostage by drug barons but as likely by government-backed militia in an effort to contain popular resistance. Salcedo has lost members of her own family in this way. Salcedo travels extensively in the countryside where the worst effects of political violence are experienced. She becomes familiar with communities, befriending people who have suffered under the repression. For them the most painful thing is that people disappear without trace. No charges are laid, no arrest is recorded, no body is found. Death can be mourned but disappearance leaves an unbearable void. These disappearances are a deliberate strategy to demoralise and terrify the people in order to ensure their silence. If they speak and their relatives are alive in prison, they could be signing their death warrant. They too could disappear at any time. On her travels Salcedo collects attributes of the disappeared with the support of their relatives. By constructing these works as a form of memorial and exhibiting them around the world, Salcedo has given these people a voice. In a small way, our response to their agony strikes a blow against the dialectics of violence. 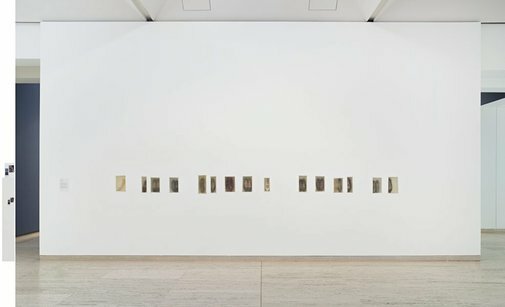 In one such body of work she collects items of domestic furniture – wardrobes and chests of drawers where traces of a missing loved one have been kept and beds which were once shared with them (see 'Untitled' 2007, AGNSW collection). These are at once memorials to the lost but also horrifying reminders: the domestic is rendered monstrous. Salcedo fills these objects with white cement, rendering them mute and utterly dysfunctional. In this way she not only pictures the silence that kidnapping enforces but shows us how this terrifying form of political action makes monsters of us all through our complicity in the silence. In 'Atrabiliarios' Salcedo evokes absence and loss by using materials and processes that locate memory in the body. The viewer's response is, in turn, emotional, even visceral, rather than purely intellectual. Niches cut into the plaster wall contain shoes as relics or attributes of lost people, donated by the families of those who have disappeared. Shoes are particularly personal items as they carry the imprint of our body more than any other item of clothing. 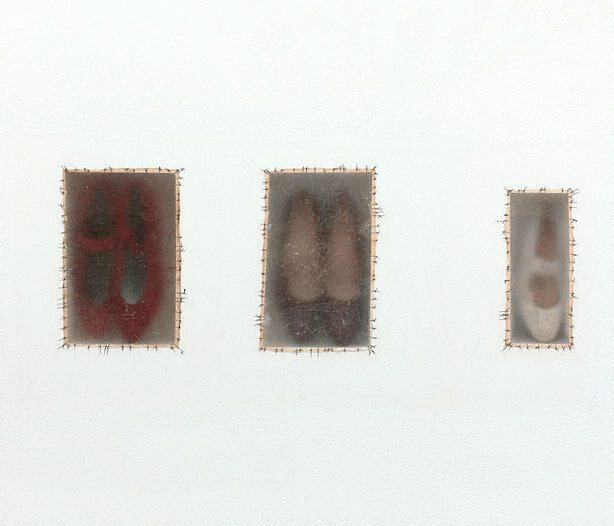 She then sealed the niches with a membrane of cow bladder, which she literally sutured into the plaster of the wall as if picturing the literal process of internalised bodily memory. Barely visible through the animal skin membrane, the shoes are a haunting evocation of their absent owners and inevitably recall the grisly souvenirs of Nazi death camps. Anthony Bond, Trace, 1st Liverpool Biennale of Contemporary Art , 'Trace: a historical contextualisation of the theme', pg.12-21, Liverpool, 1999, 14 (colour illus. ), 15. The reproduction is a detail, this work is not in the exhibition but is reproduced in the catalogue. Anthony Bond, Contemporary: Art Gallery of New South Wales Contemporary Collection , 'Imagining the body', pg.246-289, Sydney, 2006, 247, 288, 289 (colour illus. ), 430. Charles Green, Art and Australia (Vol. 35, No. 4) , 'Exhibitions: Deciphering multiples: body and gaze', pp. 479 - 481., Sydney, 1998, 481 (colour illus.). Cara Pinchbeck, When silence falls , 'When silence falls', pg.2-9, Sydney, 2015, 8, 34 (colour illus. ).